My main criteria in building these trees was to make it a project I could do quickly and cheaply. I already had some tree armatures and didn’t want to spend a lot of time adding foliage. Therefore, I decided to do some winter tree stands. 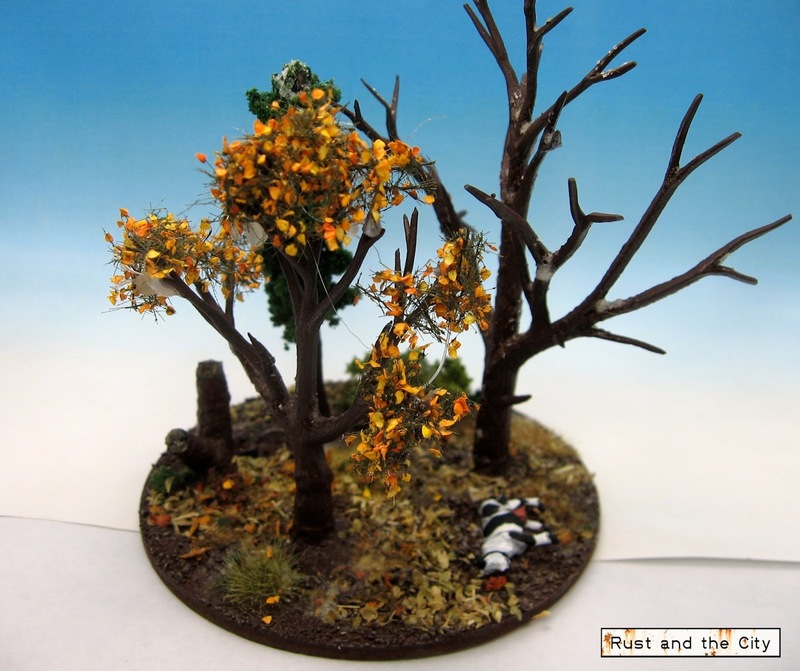 The tree armatures for this project are Woodland Scenics tree armatures. I used the 2-4” deciduous and coniferous trees. I added foliage to the coniferous trees and left most of the deciduous treeswithout foliage to represent trees after most of the leaves have fallen in the autumn. The cool autumn foliage on some of the trees are some MiniNatur clumps on horse hair backing. I love how the little leaves look. I wanted to add some snow to each base for my winter board. Unfortunately I didn’t have much Gale Force 9 snow left and so each base and tree has just a sprinkling of snow. I may add more snow in the future. Each stand of trees is mounted to a small round base. I used clump foliage, flock, and oregano for the bases. For the treed areas I cut some brown felt and sprayed some white paint with the airbrush for snow. 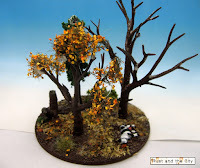 The treed area bases are pretty simple and look alright on the table. In the future I may experiment with adding some flock to the felt to add more interest. This was a pretty quick project. The trees fill a single shoe box. Spread over a few felt areas I have enough trees to add four treed areas to a table. 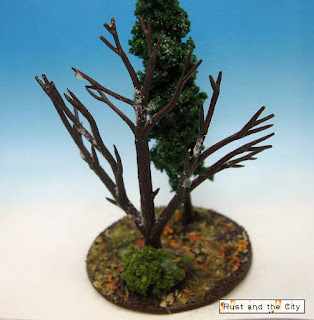 Trees make some nice and easy terrain to add to a board. In the future I may combine all of my trees on a board to make a Hurtgen Forest themed board. Might not be much fun for my tanks but it would look interesting. My terrain collection now sits at two full boards and another somewhat random board if needed. I don't think my wife will allow much more terrain into the house though... I hope you enjoyed these trees. A special note I realized as I clicked post; this is actually my 200th post! Thanks to everyone who stops by here and contributes. It has been a pleasure writing for this blog and getting to know all of you through the blogosphere. Here's to the next 200 posts! Thanks for visiting. Nice work and congratulations on your 200th post ! Thanks furphy. I was surprised when I saw I had reached 200. Instead of felt, maybe cut out a more substantial base out of foam, or wood, to use. 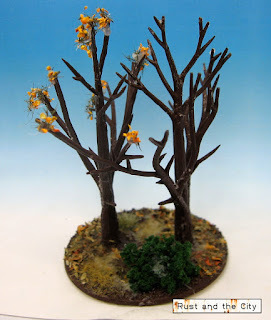 That way you can experiment a bit more with flocking and terrain, to match these lovely trees! Thanks for the comment Greg. I keep meaning to make some better bases. The felt is good for a quick tabletop set of trees. I will make some better ones soon! Well done on the 200 mark! Trees are very natural looking. Do you intend to add some more snow effect at a later date? Thanks Dai. I may add more snow. They would fit better on my snow board with some more snow but I am also trying to keep things generic so I can use them on different boards. I haven't decided if I will add more or not. Thanks! Hopefully the blog gets to 200 more! Hearty congrats on the double century, mate! 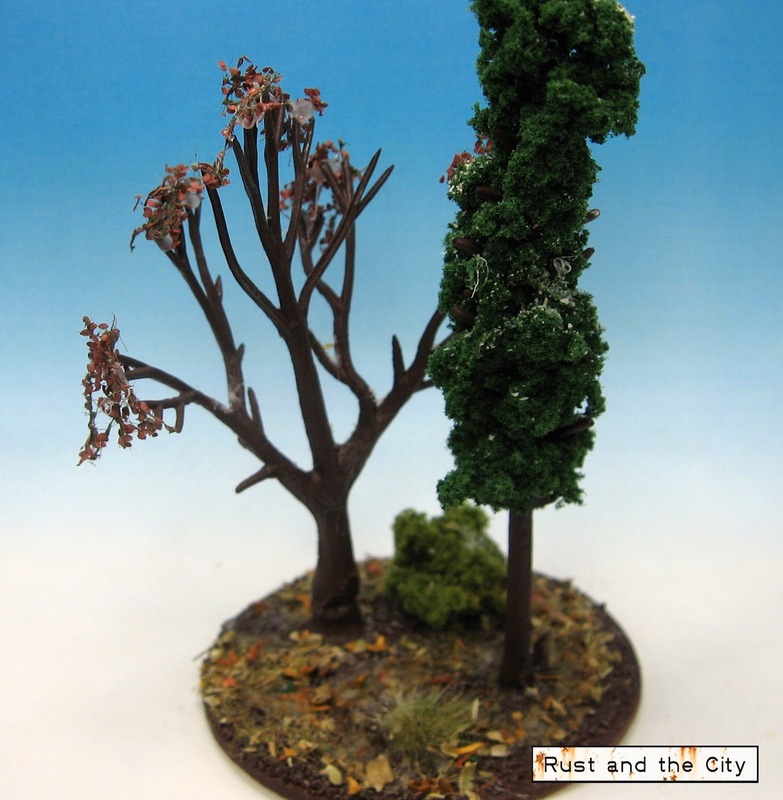 I need to make more trees and area terrain bases. Thanks for the inspiration! And congrats on 200 posts! Thanks Spiderweb. For some reason your comment got caught in the spam filter. Sorry!